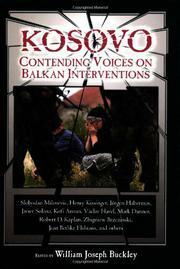 A wonderfully diverse collection of essays, memoirs, letters, and interviews that comprises a robust spectrum of views on the Kosovo conflict and the NATO air campaign. Buckley (Ethics/Georgetown Univ.) has brought together contributions from many of the major stars of the international community—UN Secretary-General Kofi Annan, Vaclav Havel, and Henry Kissinger, to name a few. What makes his collection even more impressive, however, are the pieces from unknown local figures—the Serbian citizens, the Kosovar victims of Serb aggression, and European journalists—who serve to question the realities and perceived realities of the outside observers on both sides of the Atlantic. Ivanka Besevic, an elderly Serbian woman living in Belgrade writes on the NATO bombing: “We are here, and we see it with our own eyes; every civilian target, our neighbors’ homes.” The compilation takes the reader on a tour of the complicated truth behind such simple questions as who exactly the KLA are—without providing any one answer to the perennial question that should trouble Americans most: Was the NATO bombing the right thing to do? If anything, these inquiries highlight just how problematic military intervention is. Was it necessary? The account we are offered of Serb atrocities says the answer is yes. Was it just? Accounts from the Serb perspective, in addition to rigorous political analyses from Kissinger and others tell us perhaps not. Can the peacekeeping operations be called a success? According to Buckley, that remains to be seen. His collection, although it is about as comprehensive as one volume can be, rings with the urgent message that this can be merely the beginning of reflection, analysis, and dialogue on the subject—not the end. Intellectually challenging but very readable, this examination of the most troubling European turmoil of the last decade is highly recommended for both personal use and professional reference.